The delegation from the “Celestial Empire” spent the first day of the visit in the office of the Command-in Chief of the National Guard of the Republic of Kazakhstan in Astana. 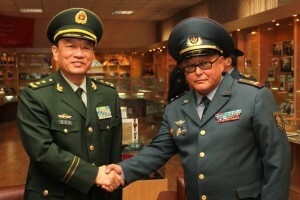 Lieutenant General Dai Sutszyun, the Deputy Commander-in-Chief of the Chinese People’s Armed Police Force, and other members of the delegation took part in a briefing in order to get acquainted to the objectives and main principles of military activities of the National Guard as well as its perspectives. The parties shared opinions and expressed the wish to reinforce the cooperation in the sphere of organizing official military activities and sharing experience. The representatives of two agencies signed Memorandum of Intent of cooperation in the spheres of sharing experience of organizing official military activities and professional staff training after the briefing. The Commander-in-Chief of the National Guard of the Republic of Kazakhstan Lieutenant General Ruslan Zhaksylykov signed the Memorandum on behalf of our country. On September 5, 2014 the delegation and the representatives of the Command of the National Guard with Major General Albert Matkarimov, the Deputy Commander-in-Chief of the National Guard of the Republic of Kazakhstan, flew to Petropavlovsk and took part in a briefing with the command, administration, and teaching faculty of the Military Institute of National Guard of the Republic of Kazakhstan. The briefing was devoted to several points of cooperation and peculiarities of the educational systems. 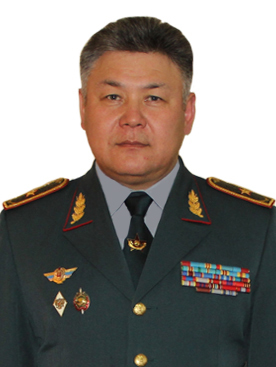 Colonel Zhumabek Akhmetov, the Chief of the Military Institute, told the guests about the peculiarities of prospective officer professional training. Then the guests visited the affiliation of the Museum of National Guard and made some photographs. Lieutenant General Dai Sutszyun wrote about his impressions in the Honorary Guest Book. After that the delegation had a short tour around the Institute and made an acquaintance with top-of-the-class cadets, sports champions, prize-winners, and Junior Sergeant Yerbol Otarbayev, a senior cadet, who had been awarded with the order “Aybyn” for his heroism and courage while guarding the interests of his motherland. Later the representatives of the Chinese People’s Armed Police Force went to Military Unit 6637 of the Regional Command “Center” to see training and sports facilities, armored vehicles and armament of the unit. It is worth mentioning that it is the first meeting in the history of the countries’ agencies. 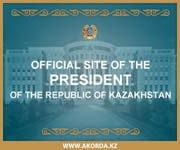 It is to give a good start for some further development of the mutually beneficial relations.